Catch the updates from the IPL match between Hyderabad and Rajasthan being played at the Uppal Stadium in Hyderabad. Hello and welcome to zeenews.com. Catch all the updates from the match between SRH and RR (Hyderabad vs Rajasthan) to be played at the Uppal Stadium in Hyderabad on Monday. See scores here. While Hyderabad have been the powerhouse of the IPL, Rajasthan like CSK, will be making their comeback to the league after two years. They were the second team alongside CSK which was banned for two years following the spot-fixing scandal. Rajasthan got a big blow days before their comeback game as their skipper Steve Smith was banned by Cricket Australia for ball-tampering in South Africa. Ajnkya Rahane was handed the reins for the eleventh edition of the IPL. SRH, too suffered from the similar incident as their skipper, David Warner, too was forced to miss cricket for 12-months after found guilty in the ball tampering incident. In his absence, Hyderabad named Kiwi Kane Williamson as their leader. With 36 needed in the next ten overs, Dhawan kept going after the RR bowling. So with 4.1 overs to spare, SRH completed a 9-wicket win over RR with Dhawan unbeaten on 77 while Williamson going back not out on 35. SRH made a winning start. With 9 fours and a six, Dhawan reached his fifty in just 34 balls. He crunched Ben Stokes through point followed by another cracker through cover for twin boundaries. In the last over of Stokes as well, Dhawan had collected couple of boundaries. Williamson has allowed Dhawan to take the lead and has now taken the back set. He has cut down all the risk and just wants to safely reach the target. This looks SRH day completely and the way mishits have reached the boundary, it looks they will reach the target under 15 overs. In ten overs SRH were 89/1. In a low scoring game like this what does a team want? The team who is about to chase. A good start without losing wickets. SRH started in similar fashion though opener Wriddhiman Saha threw away his wicket against Jaydev Unadkat trying to be over aggressive. But Shikhar Dhawan and Kane Wiliamson have found themselves in such situations many a time. They knew it was just about cashing in on the loose deliveries or even the half ones for that matter. But Dhawan was a bit lucky in the first over as he edged one to slips and Ajinkya Rahane fluffed the chance. This happened before Saha went back. From Rahane, you don't expect such an error. But that was that and after that SRH began their carnage. Though Dhawan had been lucky on Monday night as couple of his slashes flew over the slip cordon while Williamson was a delight to watch. The way he swivelled and pulled Unadkat for a six over square-leg was such a soothing sight. 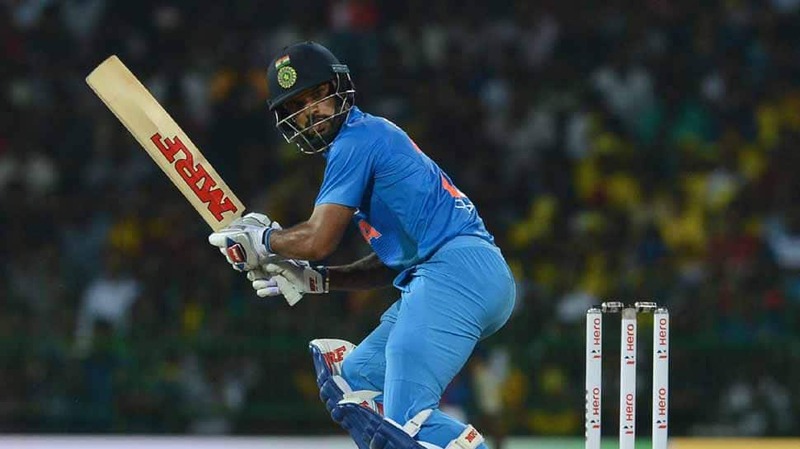 Later, as spin was introduced, Dhawan used the crease well and went deep to plonk a length ball over fine-leg from K Gowtham. SRH were cruising and were 45/1 in 5 overs. Rashid bowled the 16th over and Shreyas Gopal dabs the first ball through third-man for a boundary. Its to do with his quick pace. Opening up the face does the job for most batters. And then it's usual business for Rashid, gets away quickly with his over. Nine runs he concedes and Rajasthan need some big overs urgently. Can Anybody pls help!!! Bhuvi is called in for his third over and other than conceding a boundary to Gopal, he too finishes a good nine-run over in death overs. RR crawl to 115/6. Rashid to bowl his last. And there he is, keeping the batsmen guessing with his variations. He has a high arm action so his googly gets very beautifully disguised and from the same spot he bowls leg-spin. Jos Buttler seems to have no clue what he is hurling at him. Loses cool and drags a touch shortish delivery on to his stumps. RR lose their last recognised batting hope. Rashid is ecstatic. Gopal comes on strike and he is as clueless as perhaps Buttler was. Bowls a perfect 2-run over and picks a wicket to finish spell with 4-0-24-1. Bhuvi comes back and he signals RR's eighth wicket. Bhuvi is stunning the tail with his pace and then he unleashes his knuckle ball, on which Gopal takes a hoick and sees the shot climbing high into the night sky. Yusuf Pathan pouches it safely. RR aren't even challenging SRH. Kaul is back for the final over. Now, Rajasthan is running themselves out. Can you believe it???? This is idiotic cricket happening there at the Uppal. A team which does not even have a challenging score are losing wickets through silly run-outs. RR have made 125 in their innings. It should be a cakewalk for SRH. If anything, Williamson is after RR wickets. With Rahul Tripathi on strike, Stanlake was the best option as pace could unsettle any batsman early in his innings. And as expected, he did unsettle Tripathi with pace. The Pune batsman was beaten four times and finished a 4-run over. RR were crawling at 75/3 in 11 overs. Rashid Khan is given the ball in the 12th over. Williamson wants wickets and wants Rajasthan to keep struggling for runs. But as is the case with leggies, if they can get you wickets, they can leak runs as well. On this occasion, Tripathi pounced on to the loose deliveries by Rashid and struck him for twin fours on the off. After a long time, Rajasthan got a 12-run over. They had reached 87/3. Samson had locked one end and was batting responsibly. Kaul was brought in to put more pressure. His nagging length and absolutely no width approach gives the batters an uneasy feeling standing in the crease. Length for him seems tantamount and he finishes a brilliant five-run over. Second time in two overs, he had an outside edge flying to third man where Stanlake missed the chances on both occasions. He nevertheless praises the effort. RR is 92/3. Williamson doesn't want the batters to settle against any bowler. Having dried up runs, he wants to make it a drought. Calls Shakib in and wants him to cut the pace out completely. Shakib keeps it tight and doesn't offer width. This much is expected from the wily Bangladesh star. He knew Tripathi will step out and he bowls it slow. Tripathi fails to attach power behind his shot and holes out to long-on. Rajasthan is in trouble. Two balls later, Samson, batting on 49, loses his resolve and cool, jumps out to hole another to sweeper cover. Rajasthan are in deep trouble. RR 95/5. Shakib you beauty!!! Finishes with figures of 4-0-23-2. Kaul returns now and picks up his second wicket here. Stuns Gowtham with a measured short ball. He is cramped for space and the ball lobs of the glove to settle in the gloves of the Saha. Kaul and Shakib have sucked the life out of RR. Kaul gives 2 runs, picks one wicket. RR 97/6 in 15 overs. Shakib was brought in for the sixth over. That looked a smart move as both Rahane and Samson were right-handers and the pitch looked dry. Williamson must have thought that since both of them would be looking to jump out, any ball that turns will get them a wicket. SRH nearly tasted success as Samson jumped out and almost completed a hoick towards leg for a boundary. Lucky Samson there. Shakib mixed his pace well and finished another over worth seven runs. Rajasthan were 48/1. And then Siddarth Kaul is thrown the ball. The Punjab pacer has been known to be accurate with his line and length. And he lives up to the promise. Bowls the first four balls in the corridor and then he strikes as he gets in the deep on leg. Slows it down a touch and Rahane fails to pack power his flick. Rashid Khan pouches it safely at deep square-leg. Big Blow for RR. 56/2. As Ben Stokes walked in, Williamson brought in Rashid in. Research tells that Stokes got out a lot to leggies. Even Stokes is aware of that and tries a switch hit only on his second ball. Misses it and somehow gets single to go the other end. Samson too struggles to pick Rashid as the final ball literally crashed into the stumps. Rashid just gives one. RR 57/2. This is a below-par ten over score. Williamson knows Stokes might have problems against Rashid but he can certainly take Shakib or Kaul to the cleaners. with his brute power, he can really stand and keep muscling. So he offers pace of Stanlake to Stokes. After both Samson and Stokes exchange ends on the first four balls, Stokes takes a chance but holes out flat to Long-on. Another big blow to RR. They needed him there. But they were 63/3. Under-pressure certainly and the pressure was on Samson to see them through. With Rahul Tripathi coming in, Shakib was an automatic choice. The wily contender finishes off a good 8 run over as he knew none of them would want to take a chance at this juncture so he kept mixing his deliveries. RR were 71/3. Batting first in a T20 game comes with a lot of pressure, as the batting team isn't sure when is the good time to launch the attack. Saving wickets also stays on top of the mind. But if you are D'Arcy Short, you might not have any pressure but you certainly are prone to make mistakes. Just ask Short and he would admit that running himself out on that belter of a track in Hyderabad was his biggest mistake this IPL. Having collected a boundary, which he clipped to the square-leg off Bhuvneshwar Kumar, the push straight to mid off was always going to be risky. But Short called for it and was easily a metre short as Kane Williamson collected the ball cleanly to hit the stumps. Rajasthan were struck a big blow in the very first over at just 6. Sanju Samson walked in to face another quick bowler from Hyderabad -- Billy Stanlake. He surprised the Keralite with pace and steep bounce. But his inconsistent line and the habit of veering towards leg helped Samson to open his account with a couple through midwicket. On the last ball, Samson once again used his raw pace to get a triple employing the flick. Rajasthan were 11/1 in 2 overs. Bhuvneshwar returned but Samson's insouciance just overpowered him as the batsman punched the length ball through cover for a four. A ball later, he timed the on-drive to perfection for a four. This time Bhuvneshwar too struggles with his line and bowled in the opposite direction to where his field was placed. Rajasthan got 10 in that over to reach 21/1 in three overs. Bangladesh spinner Shakib Al Hasan took the ball in the fourth over and you get the point. The idea is to cut down the pace but with two fielders out, spinners will have the risk to be lofted. After Rahane saw Shakib for two balls, he jumped out the next to crunch it through cover. Four runs. But Shakib holds his own and concedes another two to cap off a six-run over. Rajasthan were 27/1 at that stage. Stanlake was called back in the fifth but his waywardness was to be exploited soon by Rajasthan. And Rahane was quick to pounce on the opportunity to milk him for some runs. Stanlake trying to bounce Rahane out but the Indian batsman moved away and sliced it over the third man for a boundary. Two balls later, Stanlake hurled a pacey delivery slightly fuller to Samson, which he tried dragging towards leg. In the process, finds the leading edge flies over point for a boundary. Rajasthan reached 41/1 in five overs.